I read this article and found it very interesting, thought it might be something for you. The article is called 19 States Freeze MGNREGA Payments, Centre Not Releasing Funds and is located at https://archive.indiaspend.com/cover-story/19-states-freeze-mgnrega-payments-centre-not-releasing-funds-47441. 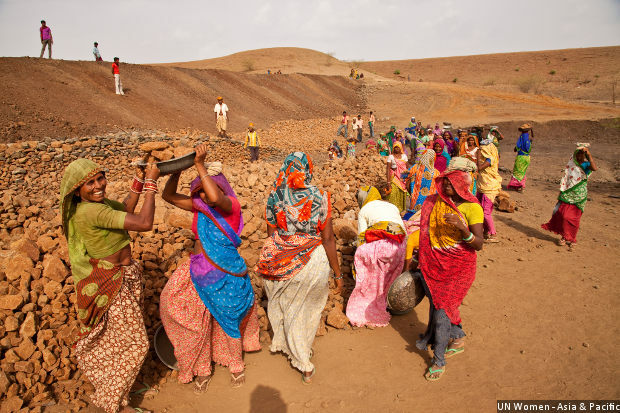 Women working on an MGNREGA site building a pond to assist in farming and water storage in Jhabua, Madhya Pradesh. Wage payments under MGNREGA for nearly 92 million workers in 19 states have not been made, data show. Wage payments under the Mahatma Gandhi National Rural Employment Guarantee Act (MGNREGA) have been frozen in 19 states as of October 31, 2017, official data show. In Haryana, wages have not been paid since August 31, 2017. In 12 states, including Jharkhand, Karnataka and Kerala, payments have not been made since September 2017. No payments have been made in six states including Maharashtra and Madhya Pradesh since October 2017. Over 92 million active workers may not be getting their wages on time and the delayed wage payments amount to nearly Rs 3,066 crore, according to a statement by NREGA Sangharsh Morcha, a network of grassroot organisations. “Immediate action has been taken on proposals submitted so far by Madhya Pradesh, Uttar Pradesh, Tamil Nadu, Rajasthan, Chhattisgarh and Jammu & Kashmir and proposals have been processed,” according to this statement by the ministry of rural development on October 27, 2017. It is mandatory for states to send audited reports of the previous financial year after September 30 every year for the central government to release the second tranche of funds. The rural development ministry statement said Rs 40,480 crore has been released so far in this financial year, which is around Rs 4,500 crore more than the release during the corresponding period of the last financial year. The ministry has also sought funds from the finance ministry to meet additional requirements. The central government has not approved most payments for 20 days in March-April 2017, and 80% wage payments in May 2017 were not processed. “While the central government has not approved funds for states that have not submitted audited statements of their funds on time, the government does not have funds for eight states: Gujarat, Haryana, Karnataka, Rajasthan, West Bengal, Mizoram, Nagaland and Jammu and Kashmir,” according to Ankita Aggarwal, co-convenor of the NREGA Sangharsh Morcha. Though there are no records of FTOs pending from Mizoram, Nagaland and J & K, all three states have negative balances in their financial statements. Workers must receive payments within 15 days of the closure of the muster rolls under MGNREGA guidelines. If the wages remain unpaid, the workers are entitled to seek compensation at a rate per day during the duration of the delay. No legal compensation has been calculated for these delays. During the financial year 2016-17, the central government estimated the compensation to be only Rs 519 crore, 43% of Rs 1,208 crore that was actually due, Scroll.in reported in August 2017. The rural development ministry calculates the compensation only on the basis of delays caused by the state government, the report said. The delay by the central government in making payments to the workers is not considered. As much as 94% of the compensation due was not approved as of January 13, 2017, according to the 2017-18 budget brief by Accountability Initiative, an advocacy. Of the 6% approved, only 61% (Rs 8.7 crore) was paid. Of Rs 34.7 crore payable as compensation for the current financial year, only Rs 3.6 crore, or 10%, has been paid, the NREGA Sangharsh Morcha claimed. The rural development ministry has said that out of Rs 80.58 crore that has been approved as compensation since the provision of paying it came into force, Rs 51.4 crore (64%) has been paid. The budget allocation for MGNREGA for the current financial year is Rs 48,000 crore, the highest ever under the scheme. As of October 27, 2017, Rs 40,725 crore–that is, nearly 85% of budget allocation–has been spent. Eleven states have negative balances (including payments due) as per financial statements on November 3, 2017. Non – payment of wages for workers in as many as 19 states is appalling. As per rules, these deprived people should be compensated for delay.